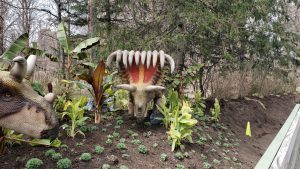 Dinosaurs will be making a big come back this summer – at the Bronx Zoo. 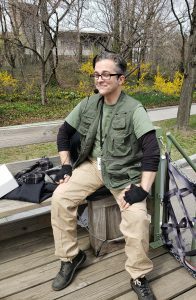 “Its been five years since the Zoo had a Dinosaur Safari ride,” said Rob Pedini, one of the Dinosaur Safari narrators said. The Safari includes 40 life-size Animatronic Dinosaurs and it spans two acres. For now, the Safari isn’t open to the public. But as of Friday April 19 it will be open to everyone. 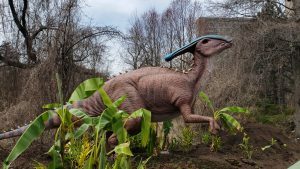 The Zoo will be offering a narrated ride and a Dinosaur Safari Field guide. “The Safari field guide will showcase each species and illustrate some of the physical and behavioral adaptations utilized by many dinosaurs and modern-day wildlife,” Pedini said. 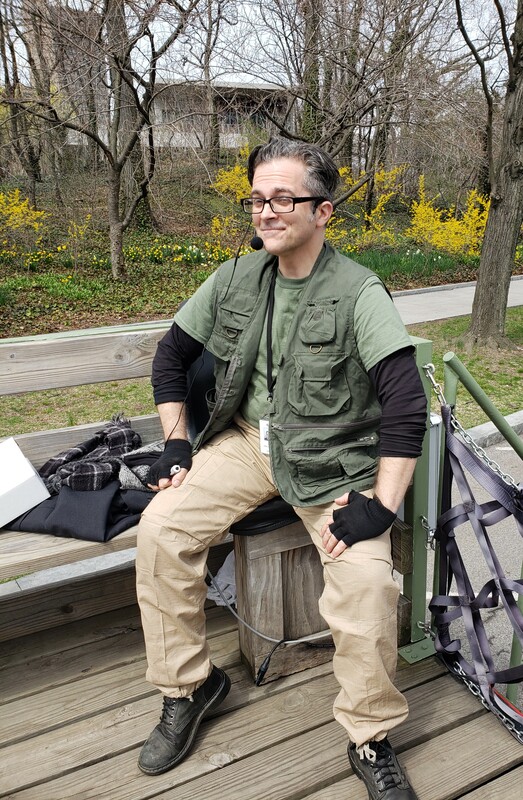 Thursday’s Dinosaur Safari ride, enjoyed by this Brooklyn News Service reporter, featured dinosaurs like Tyrannosaurus rex, which is 40 feet long. The dinosaur fossils at the zoo were discovered in the United States, Canada and Mongolia. Sixty six million years ago Tyrannosaurus rex was an apex predator and a favorite species in popular culture. The Dinosaur Safari also includes Omeisaurus. “Omeisairus is an herbivore that spans more than 60 feet head to tail and towers over the safari trail,” Pedini said. Omeisairus could eat leaves from the tallest treetops. 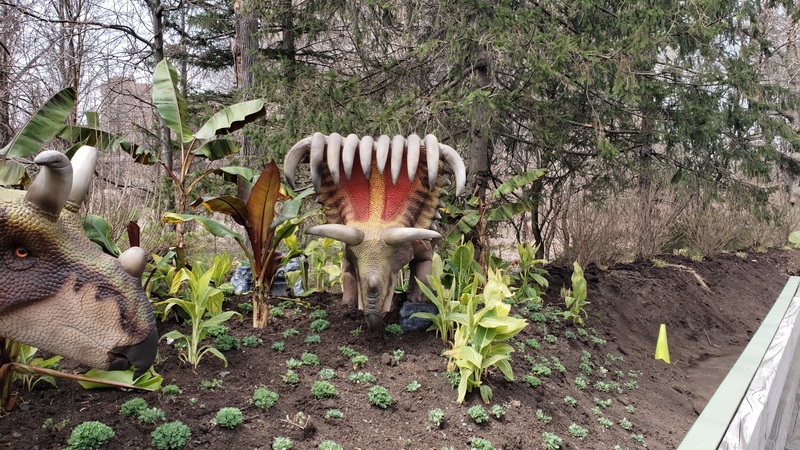 Another wonderful dinosaur on this trail is the Parasaurolophus. This dinosaur was discovered in the United States and Canada. The crest on its head allows it to communicate with others of its kind from a far distance, similar to the way elephants communicate with each other. Then there’s Spinosaurus. Spinosaurus is one of a kind. “Its fossil was first discovered in North America about 112 million years ago,” Pedini said. He said the Spinosaurus was the longest dinosaur in the history of dinosaurs, which is to say not the longest living, but longest as in from head to tail. “They stay in the bottom of rivers and swamps collecting fish very much like crocodiles,” Pedini said. Kosmoceratops is a dinosaurs with elaborate horns. It strutted the earth 84 millions years ago, in what became the United States. Paleontologists think it horns weren’t sturdy enough for defense, but instead were used by females to attract male Kosmoceratops. 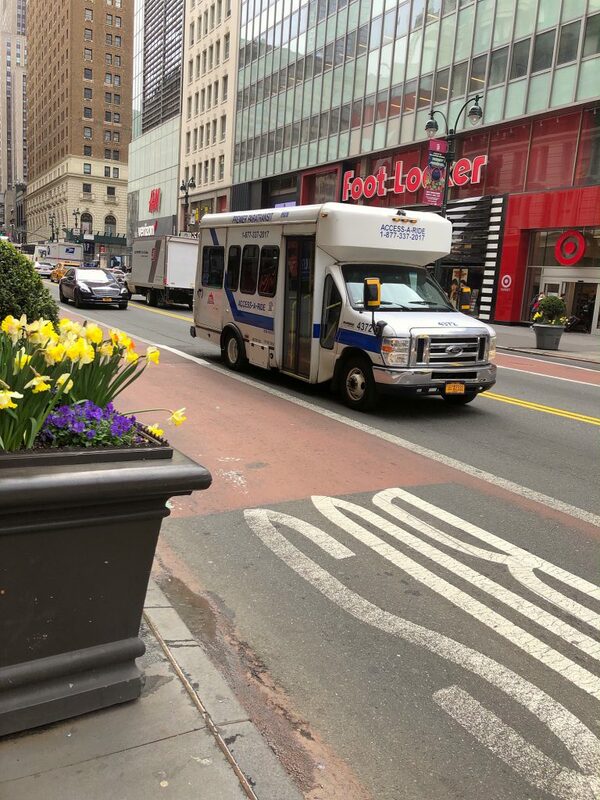 This Thursday, the New York City Department of Transportation heard testimony on a proposed rule which would allow Access-A-Ride vans to use bus lanes. “We are pleased with the fact that you have proposed regulations that will allow many Access-A-Ride riders to get around the city more quickly and efficiently,” said disability advocate Valerie Joseph. Joseph spoke on behalf of the Brooklyn Center for the Independence of the Disabled (BCID) and the Access-A-Ride Reform Group (ARG). ARG initially proposed the implementation of this rule in September 2017 as a way to improve accessibility for disabled New Yorkers. “Non-NYC Transit vehicles are allowed to use bus lanes. Why not us?” Joseph asked, referring to the current bus lane rules. Currently, bus lanes are reserved for all buses and emergency vehicles. This includes MTA buses, school buses and private buses, such as tour buses and chartered buses. Shane Anderson, with the Center for Independence of the Disabled, gave testimony about his personal experiences with Access-A-Ride. “It is unsafe for me to use mass transit at times,” he said. “However, I often risk using our largely inaccessible subway system rather than Access-A-Ride.” Anderson said he often arrives at his destination late when relying on the service. The proposed rule could help improve travel time for users because bus lanes typically have far less traffic. While advocates are grateful that DOT has proposed this change, they question why it will only apply to the Access-A-Ride vans. The Access-A-Ride sedans will not benefit from the implementation of this new rule. Eric Beaton, Deputy Commissioner of Transportation Planning and Management, agreed to review the distinction between Access-A-Ride vans and sedans within nine months. 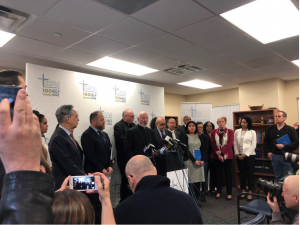 “We see this as an issue of equal rights and we see the failure to provide equal access to fast transportation as discrimination,” Lowenkron said. 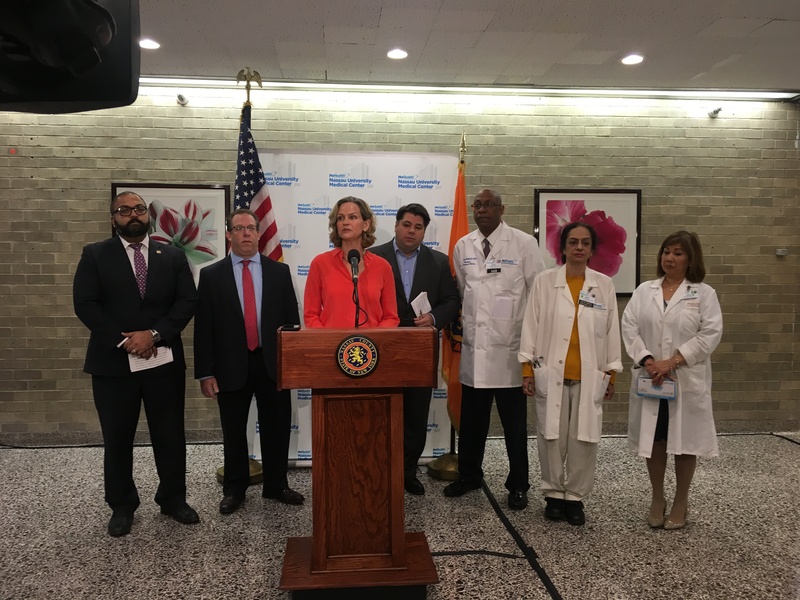 Last month, disability advocates celebrated a win against the MTA for lack of elevator accessibility. A federal judge ruled that the MTA violated the Americans with Disabilities Act when it failed to install an elevator during the 2014 renovation of a Bronx subway station. 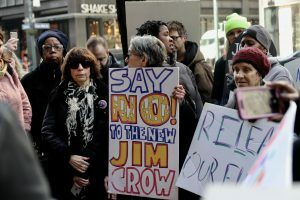 Thursday’s public hearing was held at the Department of Transportation headquarters in Manhattan’s Financial District. The new rule is expected to go into effect within 30 days. Mail deliverers in America often have to do their jobs in housing complexes and homes that are also the residence of pets, sometimes dogs that can pose a risk. 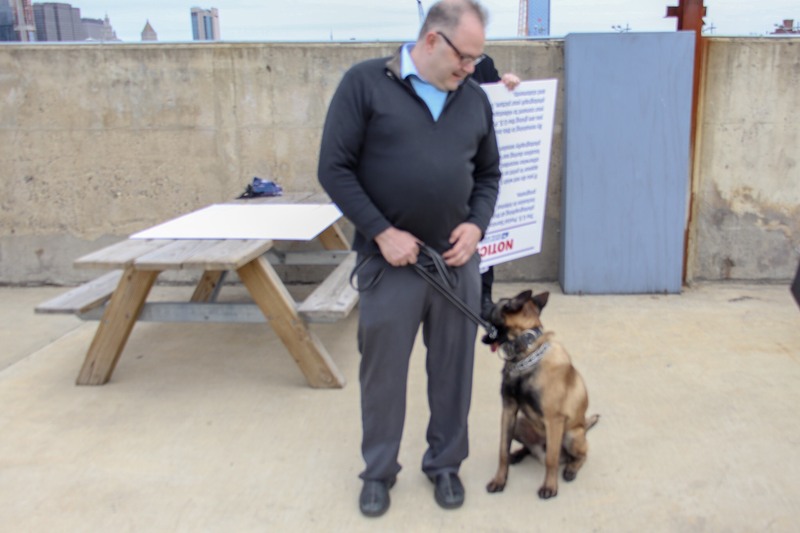 The United States Postal Service held a press conference Thursday in Brooklyn Bridge Park on the topic of dog bite statistics as it pertains to mail deliverers. They stated that dog bites fell to 5,714 in 2018 – 500 fewer than in 2017. Warning issued to USPS deliverers. This is due in part to educating workers and customers about K-9 interactions. This annual push is not only done by USPS but also by the American Veterinary Medical Association, which holds its national dog bite prevention week from April 14 through 20. USPS veteran of 25 years, Bryan Colletti, said, “As a carrier I’ve been bit twice, chased a bunch of times.” Colletti has run a charity foundation called “K-9 Crime stoppers” that donates trained police dogs. He’s been training dogs for almost 30 years. He’s personally trained over 60 dogs and they’ve been donated to police units, coastguard and more in need of a K-9 unit. Officials on Thursday gave out statistics on the top ten states that have had mail deliverers bitten by dogs in 2017 and 2018. New York City came in fourth on the top ten list with 2017 and 2018, with a few hundred each year. 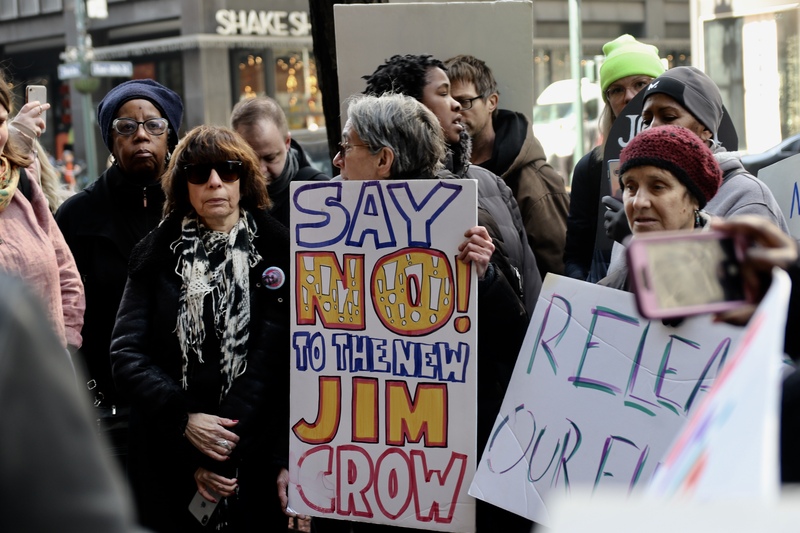 About two dozen people stood in the cold outside Governor Cuomo’s office in Midtown Manhattan to demand parole justice. New York state law allows for 19 commissioners on the state’s parole board. Currently, there are only 12 of them in position, tasked with interviewing tens of thousands of incarcerated applicants every year. 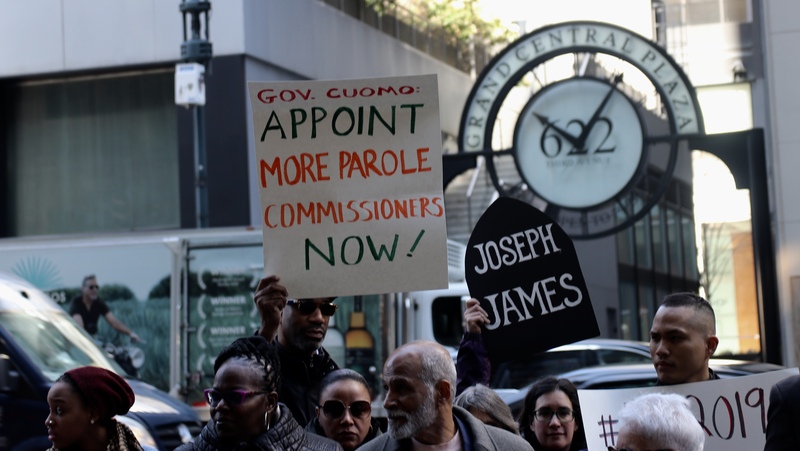 Rally-goers asked for a full staffed parole board, with commissioners who “embrace the concept of change and transformation,” as George put it. Keila Pulinario, a formerly incarcerated business owner, spoke about her own experience. The New York City Council is advocating strongly for ranked choice voting to be included in the New York City Charter Revision Commission for future elections. 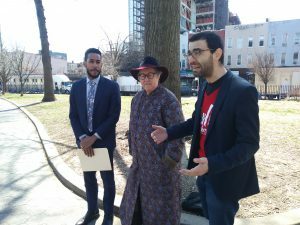 Council member Antonio Reynoso, along with Susan Lerner, Executive Director of Common Cause NY, answered questions Thursday about the charter revision and ranked choice voting at Maria Hernandez Park in Brooklyn. The New York City charter is the basic document setting essential procedures of the city government. Through the New York City charter revision commission, the current New York City charter will be open to revision. The Mayor has appointed a Charter Revision Commission. The City Council has also created its own commission. Both commissions will hold hearings to get public input, analyze the entire chapter and make proposed changes to put on the ballot. Vicky D’Anjou-Pomerleau, an administrator at BedfordStuyvesant New Beginnings Charter school, believes that ranked choice voting is a very important component to a new democracy. Ranked voting allows voters to rank as many candidates as they want, in order of the voters’ choice. “Having ranked voting actually allows and encourages a very wide field that may or may not be partisan,” D’Anjou-Pomerleau said.